You wake up refreshed and ready to take on the day when, suddenly, you realize, there, on your once-smooth skin, a pimple emerging in all its red, welted glory. 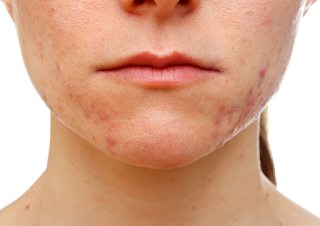 Marla Ahlgrimm says this scenario is all too familiar to women of all ages and here explains acne and why it isn’t just a teen issue. Marla Ahlgrimm: While considered a common skin disease, acne is simply a condition where the pores of the face, chest, neck, back, and possibly shoulders become clogged. This can happen due to an excess of natural oils or the overproduction of the bacteria P. acnes. Q: Why does acne affect women? Marla Ahlgrimm: Most adolescent girls and young women will deal with pimples at some point during the course of their lives. Unlike pubescent boys, who often experience severe, widespread acne, girl’s acne is linked to hormonal changes, such as during the menstrual cycle or the onset of puberty. Teenage girls are especially prone to feelings of depression, low self-esteem, and poor body image due to the unsettling appearance of acne. However, it is not limited to teenage girls. In fact, many women experience skin issues for the first time in their 30s, 40s, and beyond. Q: Other than hormones, are there any other acne triggers? Marla Ahlgrimm: Non-hormone-related acne may be triggered by certain medications, failure to remove makeup at night, and friction. Women with a family history of skin issues are at a greater risk of developing acne or other skin concerns. Q: Is it true that acne can be controlled by eating certain foods? Marla Ahlgrimm: While eating a healthy diet is important for overall well-being, scientists have not found a definitive link between eating bad foods, such as chocolate and French fries, and acne. Likewise, there is no miracle diet that will prevent outbreaks. Marla Ahlgrimm: Mild to moderate acne may be treated with over-the-counter creams and lotions. Chronic and severe cases are addressed with stronger, prescription medications that work to prevent scarring and reduce the appearance of active lesions.